Disability is not a tragedy; it is a fact of life. Sometimes people are labelled as having a disability and you can’t see the real person then. Self-directed support means putting people in control of their lives and this started in California. Now it is all over the world. Unfortunately, most governments still don’t treat disabled people as full citizens. In the past, too much money was put into institutions. The person themself are the best person to make decisions affecting them. Institutions change slowly whereas the person or their family can try new things and make changes quickly. Government is not the best tool to make peoples lives better. Obstacles to Self-Directed Support include: Fear of change / Bureaucratic inertia / Poor system design / Fear of cuts. Disability is not a tragedy; it is a fact of life. But often people’s experience of disability can be tragic. Disabled children and adults, all full of wonderful gifts and passions, can be treated as if the only thing important about them is their impairment. For too many people this leads to lives that are limited by low expectations and controlled by institutional care services. For more than 50 years disabled people, their families and allies have been resisting these prejudices and working to close the institutions that control them. Out of these efforts many helpful ideas have emerged, and self-directed support is one of those. Self-directed support means putting people in control of their lives and of the support they need to live as citizens. The first examples of this started in California, where people with physical disabilities were given individualised funding to employ their own personal assistants. They also developed a shared system of support, called a Centre for Independent Living, where people could work together and also provide additional services. Over time this good idea spread, although it has developed differently in different communities. In Canada, people with intellectual disabilities and their families were early champions of these ideas. 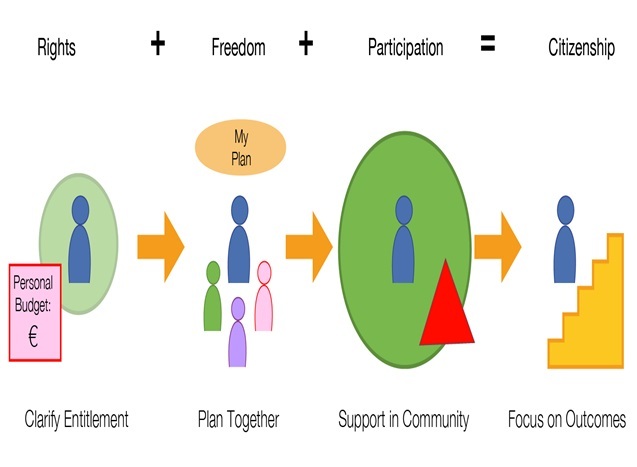 In Germany this model is the dominant way of providing support to older people. In the USA there have been successful pilots for people with mental health problems. In England the idea has spread into children’s, health and education services. There is no one perfect system, and there is a lot of confusing jargon: personal or individual budgets, resource allocation systems, brokerage, support planning, supported decisions, individual service funds and much more besides. But at the most basic level, there are probably four key features to any decent system of self-directed support. Rights – Everyone of us has human rights, and in a decent society those rights are respected and protected in law. The welfare state exists to protect people’s social and economic rights. For example, disabled people need a budget in order to get the help they need to contribute to society. It is very important that budgets are clear and fair, so people get enough to live their life. Freedom – We all need freedom and the ability to control our own lives. For disabled people, this means they need to be able to control their own budget and make decisions about their lives. For people with intellectual disabilities and others, this also means having support from family or others to help people make the right decisions for their life. Participation – We live life by playing a full part in our community. For this reason, disabled people must be able to use their money to join in, get a job, get a home, and to spend time with friends and family. So any personal budget should not just be for services – it is vital that it can be used flexibly and creatively. Citizenship – The point of all self-directed support is to enable people to be citizens. It is the combination of rights, freedom and an ability to join into community life means that the person is not only recognised as a citizen, but also that they can make a vital contribution to their community and the wider world. If you think about self-directed support in this way, you can see that it is not just some technical change to a system of services. Nor is it just a new system of shopping for services. Instead it is a way of reclaiming the citizenship of each disabled person – as a full equal. Unfortunately, most governments still don’t treat disabled people as full citizens. Instead, most still preside over a paternalistic welfare system that tends to treat people as if they are objects. But this is not working well; governments are struggling to cope. So the good news is that governments can now be persuaded to change their systems towards self-directed support, because they can see this might be a much better way of organising things. In the past, too much money was invested in institutional solutions (day centres, care homes, hospitals and prisons). But these systems don’t lead to the best outcomes for people; they are often wasteful or even damaging. However, when people are offered the chance to exercise more control then they can begin to change how things work for themselves, and this can lead to better outcomes. People will quickly stop anything that is not working for them. It is probably the last point that it is most important. There are many excellent social workers and well-intentioned professionals. They are mostly trying to do the right thing and make good decisions, in the person’s best interests. Once a service or solution is set up, they tend to move on to the next person. But real life isn’t like that: we change things all the time; we reject things that have stopped working for us; we try out new opportunities; and we learn from other people’s successes or failures. In other words, when we take decisions away from people and from those who are close to them, then we end up locking people into systems and supports that don’t change quickly enough. But, if we give people the power to say ‘no’ and to try something different, then things can keep getting better. This helps explain why self-directed support consistently shows better outcomes for disabled people in international research. The potential benefits of freedom and control are profound. For example, Jonathan is a young man with intellectual disabilities and a chronic health condition. For 3 years before he used self-directed support, he was in hospital for 150 days due to severe breathing problems. This was because the many people supporting him (nurses, teachers and support workers) were never able to concentrate just on him. When an illness began it was identified too late, and serious health problems followed. In the 3 years after his family started to manage his budget (funded by social services, health and education) he spent only 2 nights in hospital – both times for elective dental treatments. He had a dedicated team of staff who worked with him, and instead of going to college, he got a job in the building trade. He now has two City & Guilds Qualifications. When health problems begin, they are nipped in the bud immediately. Over a three-year period, Jonathan’s new services saved the NHS, local government and the education system over £100,000 in hospital stays, over £300,000 in residential care costs and over £100,000 in educational funding. Getting things right is good for people and for the system. You can think of self-directed support as one part of a much bigger change needed to modernise the welfare state, support citizenship and strengthen community. Disabled people are not the only group who face discrimination and whose lives are unduly limited and controlled. You could even argue that most of us are living in a society that doesn’t really make the most of our gifts and talents. We still expect government to solve complex social or economic problems; but many of these expectations are unrealistic. Governments can do some things really well; but there are many things that governments can’t do. Governments can’t lead our lives for us, they can’t bring up our children for us, and they can’t take care of our communities for us. This doesn’t mean government has no role, but rather that this role is to ensure that we each have the resources necessary to lead our own lives, care for each other and contribute to the wider community. This change will not happen naturally or inevitably, and there will be many obstacles. Change will only happen when disabled people, families and allies organise to exert pressure on the system to change. In order to do this it will also be important to think about the likely future problems. Fear of change – Many people, especially those running large organisations, fear change. They do not want to be accountable to disabled people and their families. They have good intentions, but they see no reason to give away power. Some families or disabled people may also fear change, because change is unpredictable. So it is very important to offer everyone a positive vision of the future. Change is necessary, but we must also respect people’s different perspectives and experiences. Bureaucratic inertia – Even if people accept the need for change, there is always a danger that the bureaucratic system will undermine the possibility of meaningful innovation and creativity. There is a natural tendency for systems to impose rules and controls, often based on people’s worst fears, and in the process strip away the real value of self-directed support. A common observation in the international research is that systems with high levels of flexibility work best; but often it takes hard work to persuade the system to respect this need for flexibility. Poor system design – All the research on self-directed support shows that it helps people improve their lives. But some systems are highly efficient and effective, while others are too expensive and break down. We may not think that it is a bad thing to spend more money; but unfortunately, if spending is uncontrolled and unplanned, then the new system will be closed down. The smart thing to do is design a system that is efficient; this help keeps the pressure on the system to improve. Fear of cuts – Many people think that self-directed support might be a good thing, but that budgets will be cut and that it is easier to defend institutional services. Certainly there have been severe cuts in England (although these have targeted both services and budgets). However the underlying problem is not individualisation, it is the fact that social care is not valued by the wider public. Cuts target social care because disabled people are not seen as valued citizens and the system is not seen as relevant to ‘everyone’. This is the key problem advocates must face. One of the most encouraging international developments is in Australia, where after intensive campaigning by disabled people, called Every Australian Counts, the government has backed an overhaul of its disability funding system. The new system is better funded and based on the principles of self-directed support. Advocates argued anybody might become a disabled person, and when this happens everybody should be able to play their full role as a citizen. It seems to me that this is how we should approach the topic of self-directed support. It should not be treated as a special system, only relevant for a few disabled people. Instead we should try to revolutionise our approach to disability. We should be outraged when people do not have a meaningful right to contribute to our communities. We should build the case for self-directed support based on human rights and a vision of a world where everybody matters, and where everybody has a role to make the world a better place. Self-directed support is a way of giving disabled people control of their lives and their support. It started 50 years ago and it works very well in lots of different countries, but it has not really come to Ireland yet. If disabled people and families want to have more control over their lives then they will need to work together to challenge and change the old system. In order to do this, it will be necessary to help other people understand that disabled people have a right to contribute to the community as citizens, and that we are missing out if they don’t. Cowen A (2010) Personalised Transition – Innovations in health, education and support. Sheffield, The Centre for Welfare Reform. Duffy S (2013) Travelling Hopefully – best practice in self-directed support. Sheffield, The Centre for Welfare Reform. O’Brien J & Mount B (2015) Pathfinders: people with developmental disabilities and the allies building communities that work work better for everyone. Toronto, Inclusion Press. Murray P (2010) A Fair Start. Sheffield, Centre for Welfare Reform. Dr Simon John Duffy is Director of The Centre for Welfare Reform, and Chair of the Housing & Support Alliance and policy advisor to the Campaign for a Fair Society. Simon is also an Honorary Senior Research Fellow at the University of Birmingham’s Health Service Management Centre. Simon also acts as the voluntary coordinator of Learning Disability Alliance England.